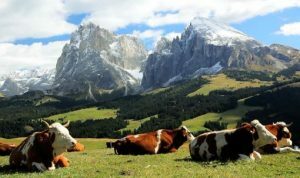 Western Ranching is Good for the Environment | RANGEfire! Note: This is the final part of a multi-part series about Seven Realities in the West that the Federal Government and the Mainstream Media don’t seem to want to acknowledge or talk about. When the series is complete, we will combine it all in one piece. The seventh and final reality is that Western livestock ranching is actually the epitome of a “sustainable,” viable “green,” productive, non-extractive enterprise that is good for the environment. While we recognize that there can be isolated examples of overgrazing and abuse, as a general rule overgrazing by managed livestock is not an issue. For the most part, Western livestock grazing converts otherwise low value biomass and forage resources into marketable protein. While it is true that expensive hay and grain production (and especially corn), can produce more protein faster, the reality is livestock grazing provides a natural, low-cost means of harvesting an otherwise unusable, renewable resource and converting it into a valuable, useable, and marketable product. There are three additional realities that envrionmental preservation activists virtually always ignore: (1) FLPMA itself expressly states that it is subject to all valid, prior existing rights; (2) FLPMA’s land-use policy mandate is multiple use and sustained yield, and; (3) FLPMA requires the federal government to coordinate with state and local governments. Western livestock ranching squarely fits the statutory policy mandate of multiple use and sustained yield. And some would also argue that resulting protein products produced in such “natural” ways have greater health benefits. But it is interesting that many of the same people who find it popular to make such health-related claims, and argue “for” more natural production methods, also argue “against” livestock ranching on arid federal lands in the West. The inconsistencies in their arguments make little sense. 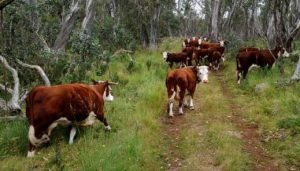 In other parts of the world, including Australia, where livestock grazing had been eliminated in national parks, there has been a big push for the return of grazing, based on the environmental benefits. According to the Wallace Center, livestock grazing both stimulates plant production, and controls vegetation. Livestock grazing is probably the most natural and cost-effective way to engage in large-scale vegetative control. 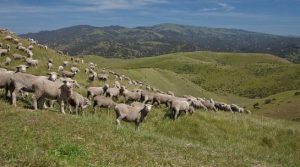 Even federal agencies have learned that target, controlled livestock grazing can be a very effective means of fire prevention and suppression. While conventional methods of fighting wildfires after-the-fact are well-known to be very expensive and “consumptive,” as an alternative, preventative measure, fire suppression through grazing is known to be both less expensive, and more productive. In many cases, federal, state and local governments (not to mention private enterprise) utilize custom grazing of sheep and goats for fire suppression purposes. Consider the math regarding the Stanton Gleave Family’s 3000 head sheep operation. At a standard fire suppression market rate of $1/head per day, on a year-round basis the federal government would have to pay Gleaves over a million dollars a year for vegetative control and fire suppression services. Yet in their sheep grazing operation, Gleaves do essentially all the work to steward the resources, and pay a fair amount for whatever additional resource “management” is provided by the government, producing marketable lambs and wool in the process. All things considered, this situation is much like the “Shop Rate” sign seen in some automotive repair facilities that says “Base Rate,$50/hour; $75/hour if you watch; $100/hour if you ‘help,’ and; $150/hour if you offer ‘advice’ or try to do it yourself.” On that basis, for the most part, Western ranchers should probably receive money just for graciously putting up with “public oversight” and federal micromanagement. Now consider the realities of endangered species. Although there will always be those who argue otherwise, there is plenty of credible evidence to support the notion that in many cases, livestock grazing actually benefits so-called endangered species. Sage Grouse and Desert Tortoises are prime examples. They don’t seem to have anything against livestock. They always seem to exist in greater numbers on private property and places where there is a greater presence of livestock, and more intense livestock grazing. And predator species, such as wolves, sure don’t seem to mind livestock either. The other related reality that seems to be completely ignored and lost in the whole discussion is the fact that aside from predators (like wolves) I don’t know any ranchers who have anything against any so-called endangered species. Most ranchers I know love to see Sage Grouse as much as the next guy. What they do have a problem with is nonsensical policies that seem to have little to do with actual protection of the subject species, and more to do with intentional, systematic demise of the Western livestock ranching industry. Pingback: Realities Nobody Wants to Talk About — Realities No. 5 & 6 — The Laws of Prior Appropriation & Beneificial Use | RANGEfire!